It is a bright Sunday afternoon, perfect for Karen and me to be working in the garden of our place, the former St. Michael’s Church and Rectory at the corner of Third and Avenue B, when an elderly gentleman walks up the driveway and shyly informs us that his mother was once the housekeeper here. Karen Guzak purchased the historic property at a bankruptcy sale in the county courthouse lobby in 1993. This made her the third owner since the local parish sold the second oldest Catholic Church in the state — just two years shy of its 100th anniversary in 1986. The Snohomish Eye in the July 14, 1888 issue reported: “The old skating rink was torn down this week, and the lumber will be used in the construction of the Catholic Church to be built here.” A. H. Eddy was awarded the contract for turning the recycled lumber into a church building on a double lot donated by E. C. Ferguson. Eddy was also about to be awarded the contract to build the first swing bridge over the Snohomish River, out of wood! He would surely need all the heavenly graces he could muster for that job. The modest church, yet with a spire reaching 80 feet, was dedicated on January 20, 1889 as Our Lady of Mount Carmel. (A name given by the Spanish missionary D. M. Cesari in 1877, which was changed to St. Michaels by the time Father Michael McCauley left in 1890!) “Its beautiful cross and spire are the first objects to attract the attention of incoming traveler as he casts his eyes for the first time upon our growing and ambitious young city,” wrote the editor of the Eye. The original façade of the church is partially captured in our historic photograph of a delivery driver and his horse-drawn wagon that came from the album assembled by the aunt and mother of our surprise Sunday visitor, Maurice DeLoy. Marguerite Moran arrived in Snohomish from Ireland around 1920 to stay with her sister Winifred, who was Father Van de Walle’s housekeeper since his first parish on the east coast. On a return visit, Maurice brought along the family album thick with pictures and clippings about life in the Snohomish parish rectory. “Father Van”, as he was called, enlarged the church to its present size in the ’20s and continued to lead the parish until his retirement in 1947 after 41 years of service. Maurice’s mother eventually married, and the family was raised in Seattle’s Greenwood neighborhood, but he remembers regular Sunday visits to Snohomish and the aging Farther Van. And of course, Karen and I are happy Maurice continues to visit us, well into his 70s now. With each visit we learn more about our historic home and studio, as well as, our adopted hometown. 230 Avenue B, circa 1915. 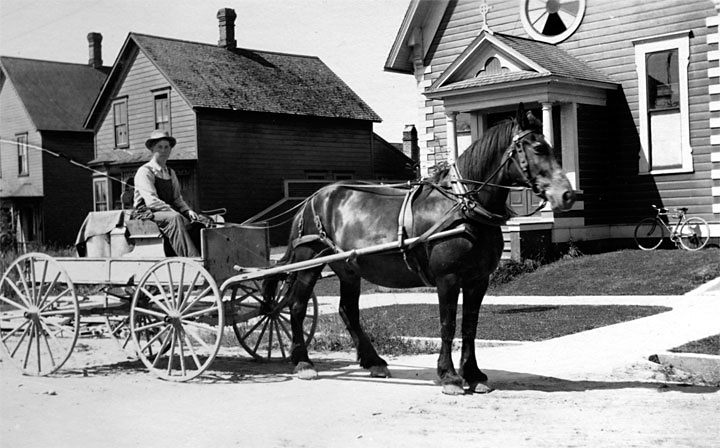 A snap taken by the revolutionary Kodak Brownie camera, we imagine, of the evidently popular delivery service still using original horse power. The shot also partially captures the original facade of the St. Michaels Catholic Church just before it was remodeled. 230 Avenue B, 2011. 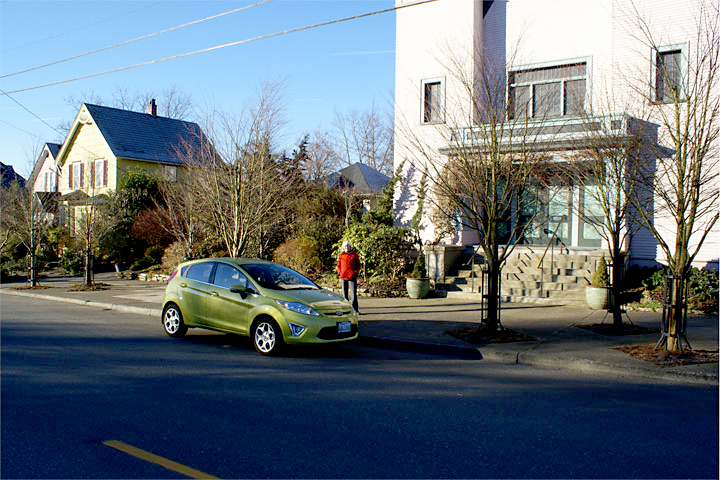 Pictured in front of the former St Michaels Church as it appears today is Karen Guzak with her new Ford Fiesta. Local delivery services fell victim to the popularity of the automobile; so that today, we run our own errands, even if you are the Mayor. Published February 16, 2011 in the Snohomish County Tribune. This entry was posted in Posts and tagged Snohomish WA history, St Michaels Church Snohomish on February 16, 2011 by warner. My father was a alter boy there! He remembers Father Van! He will be turning 82 the 23rd of August. I wish there was records at the Archdiocese of Seattle kept of his being a alter boy at this church. From my perspective, people buying churches and living in them, is just weird for me. It takes away the holiness of the purpose it use to serve. Thanks for the memories of your father and the much beloved Father Van. We bought this dear old church at a bankruptcy sale and saved it from decay, as the parish built a new church at the edge of town. The old church was falling apart and we have put our love, respect, and most of our savings into this sacred space. For us, it’s purpose is still holy – but with a broader intert: to celebrate all of life and to live in beauty.